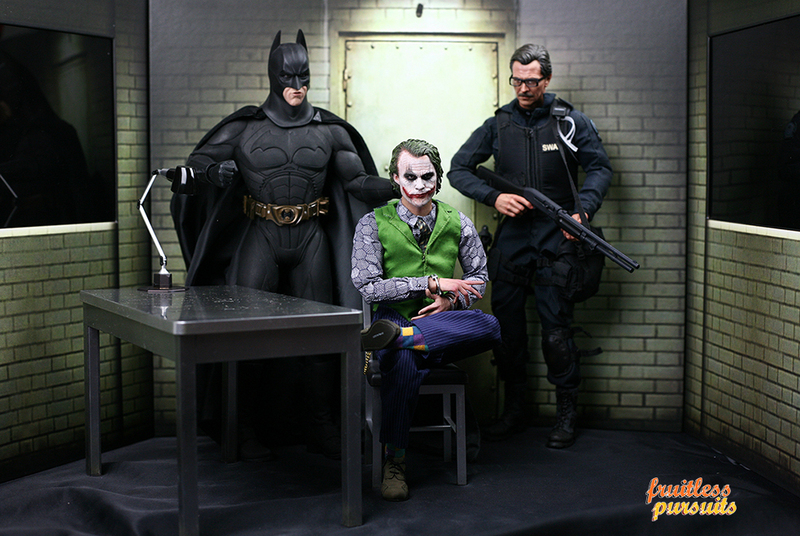 Fruitless Pursuits: Review: The Dark Knight Hot Toys DX-11 The Joker 2.0 1/6 Scale Collectible Figure! Phew! Review: The Dark Knight Hot Toys DX-11 The Joker 2.0 1/6 Scale Collectible Figure! Phew! The DX releases are always something a little bit extra special and they've certainly outdone themselves on this one. You would be a sad clown to miss all the info and a TON of images... after the jump! What could be fancier than an inviting, purple, velvet box? Lift that up and you reveal the very snugly packed figure below, along with all the production credits. But don't just pluck him out of there! As always, make sure you read the instructions as there are certain areas which require extra caution! Is this not the creepiest image to ever grace a toy review? I'm not entirely sure what's going on there. But it's scary! And here's what he looks like straight out of the box. More of him soon, but let's pause to look at what's packed underneath the foam block. The DX releases often have some kind of diorama piece and here we get the to scale desk and chair, as well as lot of props. There's also the alternative display option of the DX stand, which has two small movable spotlights built into the front. Batteries are not included, however, and I didn't have any on hand so I haven't shot it lit up. If it's anything like the DX 1989 Jack Nicholson Joker's base then I imagine they're not very bright, and won't really solve many lighting issues when you have him on display. What he's holding there is the tiny butterfly knife which is actually articulated like a real one! You can split the handle and close it around the blade. He's also packed with the infamous pencil which can be stuck into a hole on the desk. And there's also a crazily detailed machine gun and pistol, neither of which I have photograph in my haste to get to the good stuff. Because did you realise that in addition to the desk, table and lamp (which attaches via a magnet but sadly doesn't light up), you also get a huge and solid cardboard backdrop of the entire interrogation room? It's an iconic look and pose, and I loved shooting him in this environment. Check out the handcuffs in the closer shot, as well as those crazy screen accurate socks! And what interrogation room scene would be complete without the Batman! Sadly my Batman isn't the best. It's the rubbery suited Batman Begins version and he's been showing some quality control issues (a boot keeps falling off because of a broken ankle peg, one of the spikes on his forearm fell off out of the box, plus I'm terrified the rubber will split). But he still looks good in the room at least and is an adequate substitute until I can upgrade. Look at me playing with my dollies! I'm also hoping that I can fit Catwoman in here too when she arrives. She'll either have to perch seductively on the desk, or I'll have to remove it completely. She's just hit Hong Kong so should only be a couple of weeks away from Sideshow. Speaking of Sideshow, they've completely sold out of this one, but if you're quick you may still be able to grab him from our pals at Big Bad Toy Store here!